There’s quite the variety of topics to tackle this time – the best animated episode since the premiere gave another chance to artists like Kou Yoshinari to show off their unmatched skill, while Riko’s reaction to the seemingly cruel abyss tell us a lot about the humans in this world. The enchanting beauty of the setting and the arrival of Ozen, as well as the noteworthy production stability, are amongst the details we had to highlight this time. 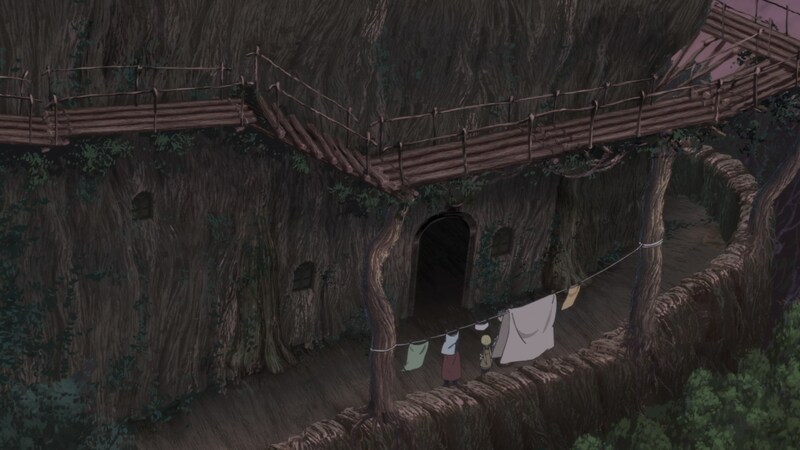 Made in Abyss is not without fault, but it keeps offering many ideas worth observing! — I feel like this episode excels at capturing the triviality of death in the abyss. Like an exaggeration of nature, abnormal creatures have developed intricate ways to capture their prey, be it other monsters or humans. Rather than just scary though, they come off as (literally) organic parts of this world. 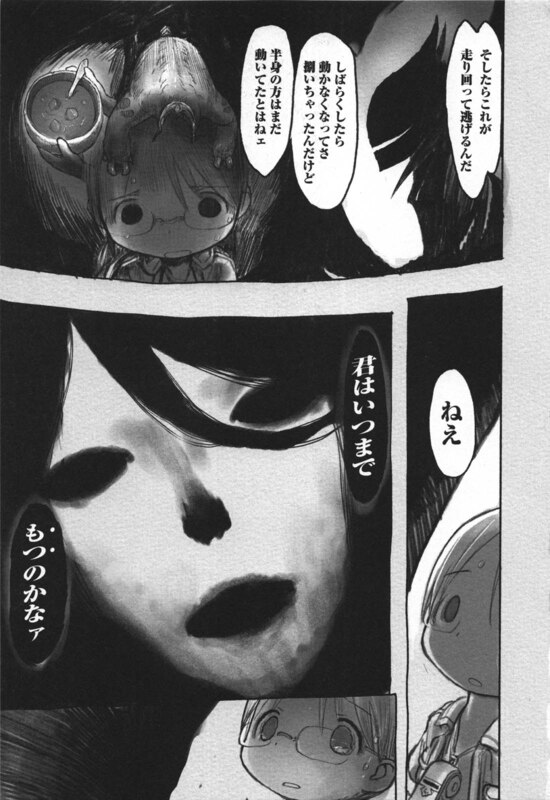 Riko’s willingness to eat them back, even though they might have devoured someone she knew, shows how ordinary of an event that is for them. — This is the second time since the premiere where I’ve been able to isolate the animation as one of the strongest elements, if not the best. For a while it had been perfectly functional with some excellent highlights, but this week it genuinely carried the episode. Not by coincidence, this overlapped with a notoriously strong list of key animators; the return of Tatsuya Miki, Satoshi Shigeta appearing as a guest (perhaps using his mechanical expertise to animate Reg’s impressive attack), plus some notable Kinema figures like the assistant designer Masahiro Suwa. The blast is by all means the highlight of the first action scene, but I’m also rather fond of the dense debris afterwards. We rarely see screens this packed on TV! — If we’re talking about animation though, you can guess who stole the spotlight again. Last time I talked about Kou Yoshinari’s spectacular work I mentioned that it felt as if he focused on giving very distinct motion to all the different creatures, so I can’t hide how nice it felt to receive immediate confirmation. The ape-like monsters they faced this week definitely possessed an agility and dexterity we hadn’t seen before. On top of that, his willingness to handle these sequences in their entirety means that we also got some excellent character animation. 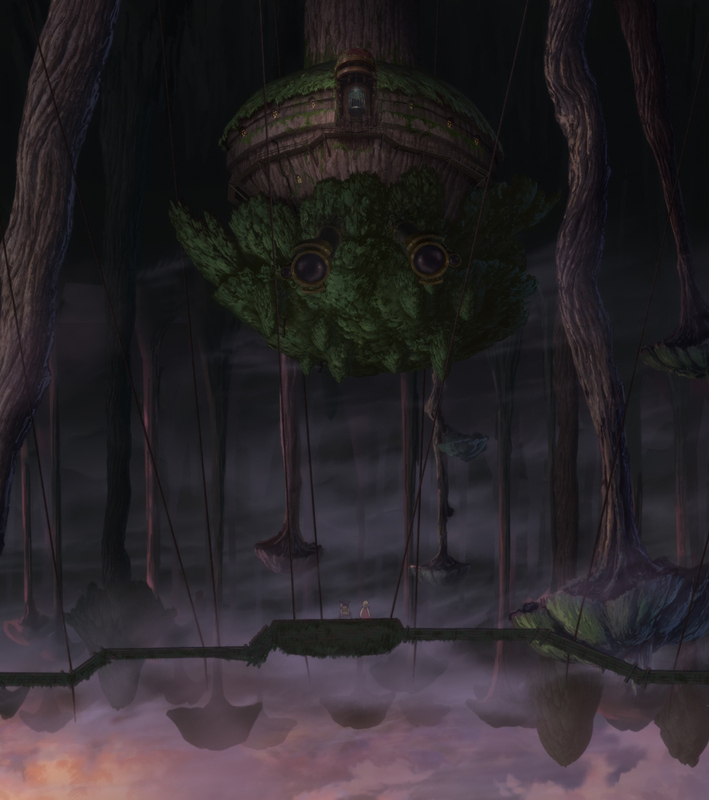 Riko and Reg’s movement is more articulate than ever, and the drawings themselves feel full and volumetric. Add some of his unmistakable FX flair and you get his best work on the series so far, which likely means the strongest sequence in the series altogether. 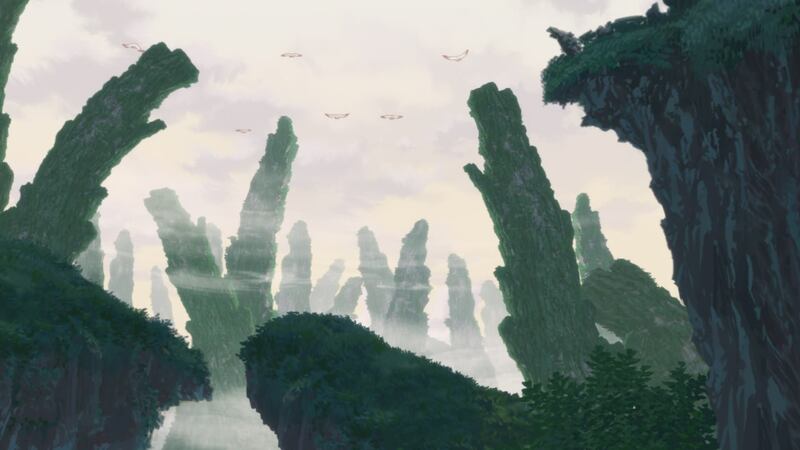 — My coverage of Made in Abyss so far has offered non-stop glowing praise for the adaptation, which I feel the staff have earned; they mentioned that their goal was simply to match the atmosphere of the manga, but as far as I’m concerned they’ve actually crafted an even more memorable world with an impressive sense of cohesion. When it comes to this episode, though, I feel like the anime has underdelivered for the first time, at the very least judging by the high bar it set for itself. This week we saw the introduction of Ozen the Immovable, a fellow explorer who is deeply unsettling at the best of times. 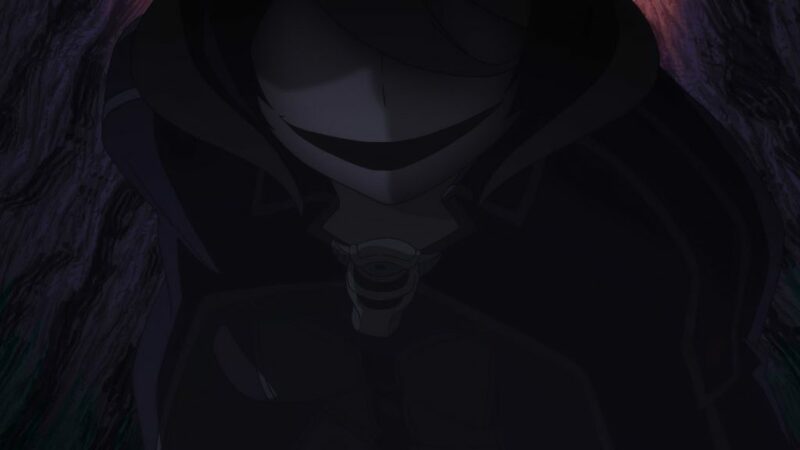 As of late I’ve been content with only following the anime, but this episode made me return to the manga for a moment to confirm my suspicions: Ozen’s screen presence can’t compare to the impact she had in manga form. 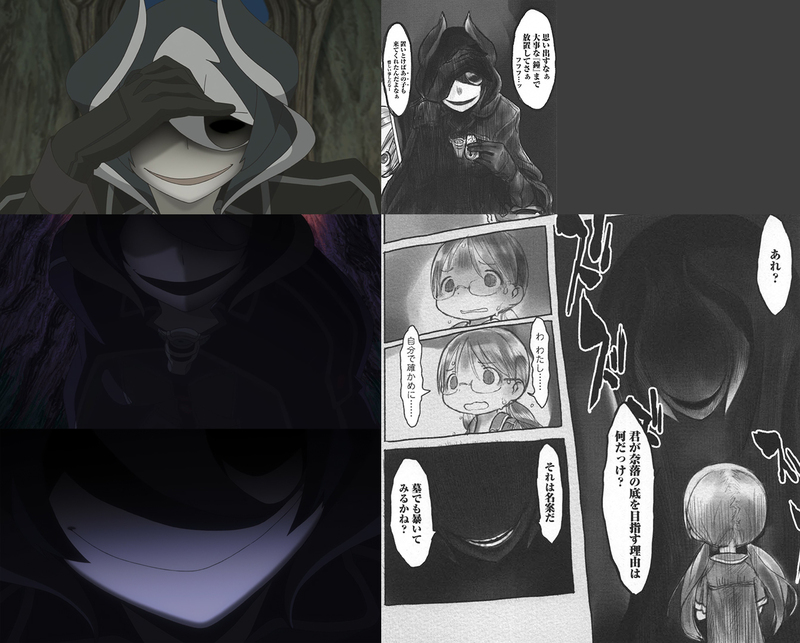 There are some neat moments like the accentuation of her devilish silhouette, but especially in the few instances where her monstrous existence leaks through it just lacks that punch; trying to just mimic the same shots isn’t the greatest idea since anime generally has less illustrative power, and an amorphous mass of terror like Ozen fits the B&W comic more to boot. Over the last couple years I’ve been pointing at Ougi from Owarimonogatari as an excellent example of a character with immense screen presence and genuinely creepy demeanor, always exaggerating her inhuman pervasiveness through the framing of her shots – which do feel hers. It’s not as if she’s a perfect equivalent to Ozen, who is more of a tainted mountain than slimy terror, but it’s the kind of approach that I would have liked. Next week she’ll have even more focus, so here’s hoping the direction is more inventive. Her character is fascinating, and it feels like it’s just one step away from being truly memorable. — Now that we’re halfway through the series, there’s a staff curiosity that I feel is worth pointing out: every single episode has been directly handled by someone from the core team of directors. 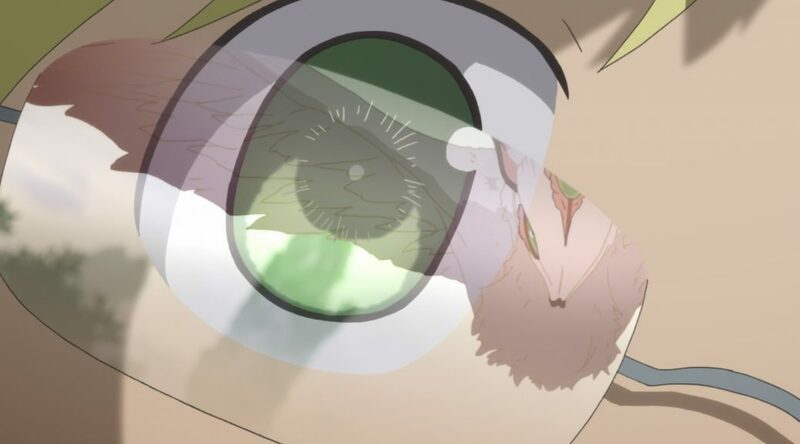 The vast majority were storyboarded by the series director Masayuki Kojima, and the rare exceptions like this one and episode 4 feature one of his assistants either replacing him or directing the episode. Series directors tend to want to preserve their vision, but that’s often complicated when individual episodes bounce all around the industry. Every now and then we see someone trying to bypass that issue by fully storyboarding their show – this season’s Kakegurui might be one such project – but that’s often reserved to productions with a lot of lead time…or ones so rushed that the series director believes they can trust no one but themselves. Made in Abyss is definitely on the healthier side, and so Kojima has tackled a huge workload while trusting his two assistants with the episodes he’s not managing himself. And so far so good, since as I said before, the cohesive vision in the show is a delight. — As much as I highlight the solid state of the production, this is definitely the least polished episode so far. It’s not as if it fell apart, but it sure does sport more than a few wonky drawings. Don’t take this as major criticism though: if this acceptable episode still produced by a fairly small crew is as weak as the production gets, then it’s a victory as far as I’m concerned. Every episode has featured only one main animation director without a visible chief supervisor figure, and the team of animators is small and consistent (Shinya Uchida has provided key animation for all 6 of them so far!). The early promotional videos still feature footage we haven’t reached, which by the looks of it was naturally finished by that point. All signs point to a well-managed project! — I couldn’t end this without another acknowledgement of the excellent work by the art department. Even as they’re forced to outsource a higher percentage of the backgrounds, the result is still excellent, both conceptually and in execution. We’ve been able to experience more awe-inspiring sceneries and as of this week, some more fascinating constructions too. 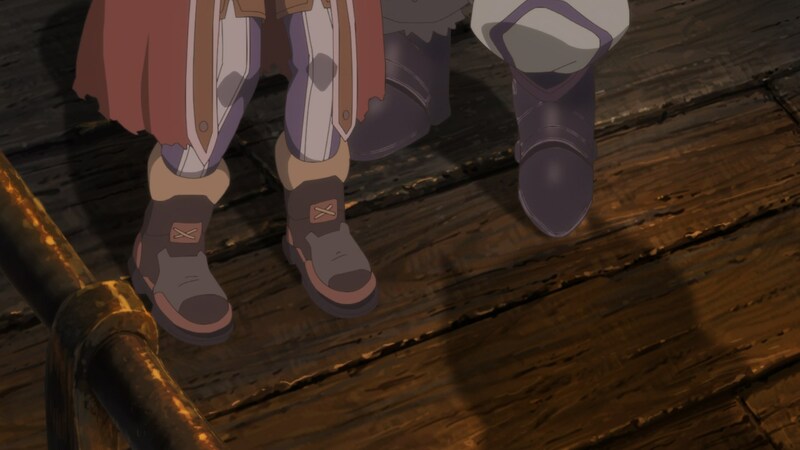 Made in Abyss is unsurprisingly still all about the abyss. Definitely agree about Ozen’s presence in the anime so far. Really hoping they make her as visually striking and memorable as the manga incarnation in ep 7 – her character really deserves it imo. Chances are that next episode will make more of an effort to highlight her presence, since it covers more tense events. And it’s not like their attempt here was particularly bad, but she really deserves an inspired treatment. I am really hoping ep. 6 was sacrificed in order to focus on ep. 7, since story-wise it will be the first climax of the anime.